This chapter is written by Agur, a man who we have never heard of and is only mentioned in this chapter of the Bibe. Agur thinks very little of himself (v2-3), yet sees the evidence of God's hand in nature and teaches with riddles. Agur seems to have a way with numbers - they allow him to attempt to group common thoughts together. The Bible, in general, is for our edification; in Agur, we see that he was a wise man for understanding and acknowledging the vastness of God. 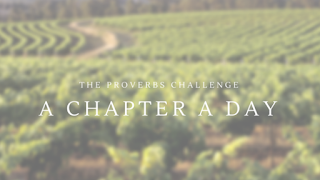 Let's look at some of these gems found in Proverbs 30. 1. Take a way vanity and lies – He didn’t want anything that gave him a proud heart. Pride is detrimental and goes before a fall. 2. Give me neither poverty or riches - Agur wisely prayed for a median state - a state that would provide him with what he needed, no more, no less, that he might be kept at a distance from temptations. 1. The grave - death is inevitable, and it seems we die faster than there are places to bury us. 2. The barren womb - a woman unable to bear children wants to have them; craves them. 3. Land, which is never satisfied with water - dry land needs lots of water. When I first moved to California, all the hills and mountains were brown - they were dry and parched. It hadn't rained in months and the first time it rained, it was not enough. 4. Fire, which never says, ‘Enough! - fire burns everything in its path rapidly. Because those hills were dry, there was an increased risk for wildfires. These fires raged and lasted for days; lots of land was destroyed. These things are marvelous to behold. They speak of the majesty and the knowledge of God. We may not be nature lovers, but I'm sure we've seen someone in love - not TV love but real love. As an observer it's hard to understand, but because love is making both parties happy it's beautiful to watch. This same phenomenon applies to the eagle, the snake and the ship. 4. a servant who displaces her mistress. The common element here is that all of these things are intolerable and seem out of place. The instances above show examples of position and role misused because they fall to those who have no training for them, and are therefore in the wrong place. A contemptible woman is one who is bitter because of her lack of love; her dissatisfaction with life; her envy; or her choices. The poor husband who marries her has to deal with this mindset until she recognizes she is loved and there's no need to be contemptible or odious anymore. 1. ants - not strong but they prepare their meat in the summer. 2. conies - very feeble but make their houses in rocks. The rocks protect them. Are also known as rock badgers or hyrax. 4. spiders - can be caught with the hand but lives in king's palaces. This group confounds human wisdom, but we can learn from them in particular how to work together and how to protect ourselves. 4. A king secure against revolt. These are all very beautiful to look at as they move as they display confidence. A king secure against revolt has confidence in his knowledge, his plans and those around him. Confidence is beautiful to see. Some of these sayings are really deep. Have you ever thought about some of them? Can you see a spiritual application in all of them? For me, I simply acknowledge that God knew what he was doing when he created everything, even though I don't understand everything. I may sometimes feel like Agur, but like Agur, I know that every word of God is pure; he is a shield unto them that put their trust in him (v5).